Cleaning your windows consumes a great deal time and exhausts you? You can make a change now – simply get in touch with our representatives and order our window cleaning in Hampstead Garden Suburb. We will deal with this matter for you and the final result will be ideal for all parts of your windows – the glass, frames and ledges. With our help, you will have the opportunity to do anything you like with the time you usually spend for window cleaning. But our services will give you even more, as you can see from our list of advantages. We also provide our professional services in nearby areas: Fortis Green, East Finchley, Maida Vale, Dartmouth Park, Hornsey Lane. We promise that the windows of your business premise will be clean and sparkling, like brand-new. Get that by just requesting our commercial window cleaning. For glass surfaces up to the fourth floor, we utilise water fed extension pole system which is completely safe and efficient. London is well known-for it's tall buildings. So when it comes to those highly-placed windows we will call on our rope access team. With this efficient technique, we can give you finish like no other! We are happy to use the most effective strategy to make sure that you receive the finest window cleaning. The glass surfaces of your house are going to be spotless after we employ water-fed extension pole cleaning system and high pressure cleaning on them. We use our trucks to supply the poles with water and we can reach as high as the fourth floor. In case you require cleaning of windows on taller buildings than that, we have rope access team on hand. Call us on 020 3746 3113 and get in touch with us – these efficient methods will bring you results in no time. The technicians have the skills and the essential equipment to provide you with both residential and commercial window cleaning. You can count on us for every type of glass surface cleaning. For example, we can wash small or double windows, sash ones, French doors, patio doors and bay windows. Furthermore, if you have garden glass surfaces, conservatory or roof windows, we can clean them too. We use the most advanced methods and the next-generation equipment for all the previously mentioned window types. 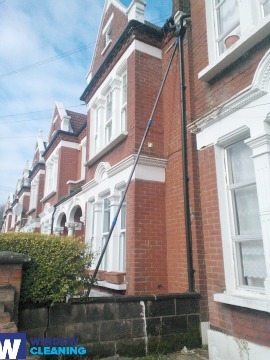 Book our prompt and dependable domestic window cleaning in Hampstead Garden Suburb. We will clean the windows of your home in and outside. The solutions we use are environmentally friendly - you will love the perfect results and make a green choice. Furthermore, we use only purified water. Don't hesitate, call 020 3746 3113 and order our top-notch services. Our customer care staff will assist you – they are accessible 24/7. Another ways of booking – our request a cleaner online form or just chat with our representatives.